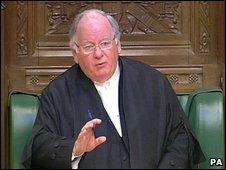 BBC NEWS | Entertainment | MP expenses: A triumph of journalism? MP expenses: A triumph of journalism? A week after its opening salvo, the Daily Telegraph is still reaping great benefit from its exclusive expose of MPs' expenses. It is a story that has shaken Westminster to its foundations and which continues to lead most news bulletins and broadsheet front pages. 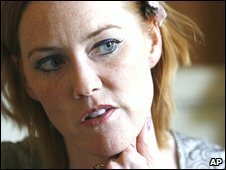 When the Telegraph's assistant editor, Benedict Brogan, appeared on BBC One's Question Time this week, it attracted its highest ever audience - 3.8 million viewers tuned in to see Margaret Beckett and Sir Menzies Campbell being heckled, more than a million up on its average audience this year. The paper itself has boosted its sales and web traffic. Official circulation figures won't be released till next month - and the Telegraph won't discuss them - but early indications suggest it sold an extra 93,000 copies last Friday, when the first revelations came out, centring on Gordon Brown's cleaning bills. Saturday's edition - which had more details of Cabinet members' expenses - sold around 56,000 more than the previous Saturday, according to unofficial sales figures. 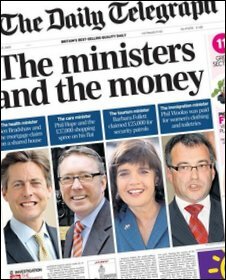 The Sunday Telegraph - which led on the Sinn Fein expenses revelations - is said to have sold an extra 25,000 copies. Earlier this week (days 4 and 5 of what the paper calls "The Expenses Files"), the Telegraph was still selling tens of thousands of extra copies. Professor Tim Luckhurst, of the Department of Journalism at the University of Kent, said: "The Telegraph titles have shown that stories still sell newspapers. "They have also demonstrated that professional journalists have the ability to interpret and explain complex material clearly. "This has been a triumph of old media skills in a convergent multimedia world. [Political blogger] Guido Fawkes is good, but deciphering and recounting such a mass of detail demands resources that lone bloggers are unlikely to deploy." In fact, the Telegraph has gained readership on the web too. Traffic to its news website has grown by around 35 per cent as it has marshalled the story with full awareness of the 24-hour news cycle - giving it maximum exposure on television and radio and driving traffic to its site. The Telegraph has been releasing the first revelations at 8pm each night, ahead of the 10pm news bulletins. At 9pm it has put out more information, followed by the full newspaper splash at 10pm. The story and the strategy have helped it attract more advertisers, such as Apple, which this week took out ads on the homepage of the website. In addition, the Telegraph continues to reap kudos and publicity value. It is a clear front-runner for the top newspaper awards for 2009 and has gained hours of airtime and editorial mentions on the airwaves (if fewer mentions in its rival newspapers). But Professor Luckhurst, a former editor of the Scotsman, says it's not just a triumph for one newspaper group. He says the Telegraph was building on painstaking work done by journalist Heather Brooke, who fought in the courts to force MPs to recognise that freedom of information really does apply to them. And other journalists have built on that work. "I expect more people have heard about the story from the BBC than from the Daily or Sunday Telegraph" he says. "And broadcasters and other newspapers have used the Telegraph's journalism to create more excellent journalism of their own. "This illustrates the importance of diversity at a time when convergence in the media and economic crisis in the newspaper industry are threatening to restrict it." There is still controversy about how the Telegraph got the information - and the possibility of a police investigation. Benedict Brogan has said: "One of the great rules of journalism is that you don't discuss your sources, so long as you establish the information is reliable and in the public interest." "We can assume that the Telegraph paid for the data, but this is not traditional cheque book journalism" he says. "The payment has done nothing to taint the source. In fact it has performed a public service." But several have criticised the publication, not just because of the way it obtained the information - but because of alleged inaccuracies and distortions. Among them is Tory MP Nadine Dorries, who wrote an angry retort to the Telegraph on her website. She denied claiming for a New Year's Eve hotel room or claiming second home allowance while only having one home. And, while many voters have told the BBC they feel "angry" and "betrayed" by their representatives, others have echoed Stephen Fry's comments that the expenses story is a "journalistic made-up frenzy" and "not a big deal".